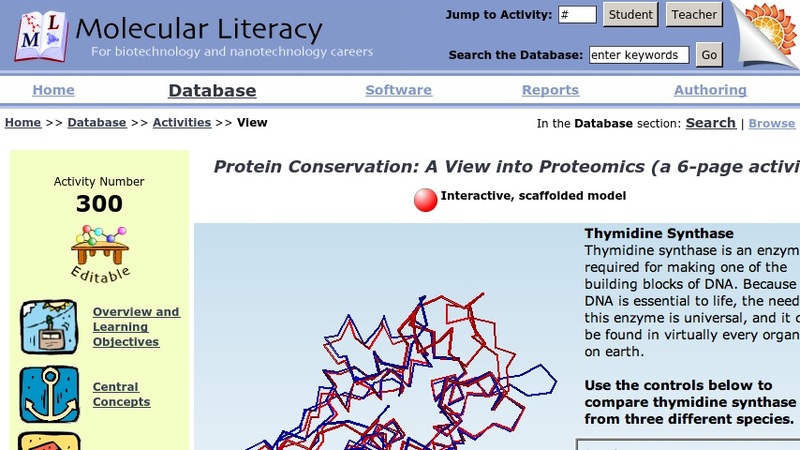 In this activity, by the Concord Consortium's Molecular Literacy project, students "review aspects of protein structure and folding and then move to 3D molecules, evaluating the consequences of both conservative and non-conservative substitutions in protein sequences. The activity culminates in a comparison of human, rat, and bacterial enzymes; students discuss why it is important for some regions to be conserved." Upon completion of this activity students should be able to explain the basic forces at work in protein folding; differentiate conservative and non-conservative substitutions in mutations; compare human, rat, and bacterial enzymes and discuss why it is for some to be conserved. The activity itself is a java-based interactive resource built upon the free, open source Molecular Workbench software. In the activity, students are allowed to explore at their own pace in a digital environment full of demonstrations, illustrations, and models they can manipulate. In addition to the activity, visitors will find an overview of the activity, a test and rubric, central concepts, and their correlation to AAAS standards.